Noon was marked in high style at the Festival of Speed: the RAF’s Red Arrows acrobatic team performed a tight and very loud flyby. Click through for the scream of nine Rolls-Royce Turbomeca Adour turbofans. 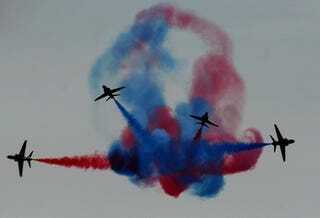 The Red Arrows use BAE Hawk T1A jet trainers to display their aerial moves in their incredibly busy schedule. The unit was set up in 1964 and has flown over 4000 shows since. Forming an excellent and even redder backdrop to their acrobatics was a line of Ferraris you can see in the video. Not a shabby selection, with the rosso corsa on one of the world’s 39 250 GTO’s, a 1969 312P Le Mans prototype and a 1950 166 MM Barchetta wreaking havoc with MPEG compression algorithms. But the real star of the lineup is the second from right: Scuderia Serenissima’s mad Breadvan. It’s the racing car with perhaps the most insane, comical, revengeful and inspiring story ever. This I knew well before Goodwood. What I didn’t was that it eclipses pretty much everything in aural ferocity. You’ll hear it soon enough.